The Russian military transport Ilyushin Il-76 plane. Russian troops transported an Aleppo resident, Sidra Zaarur, aged 10, who was injured in an attack on the city's residential areas, to Moscow for medical treatment. 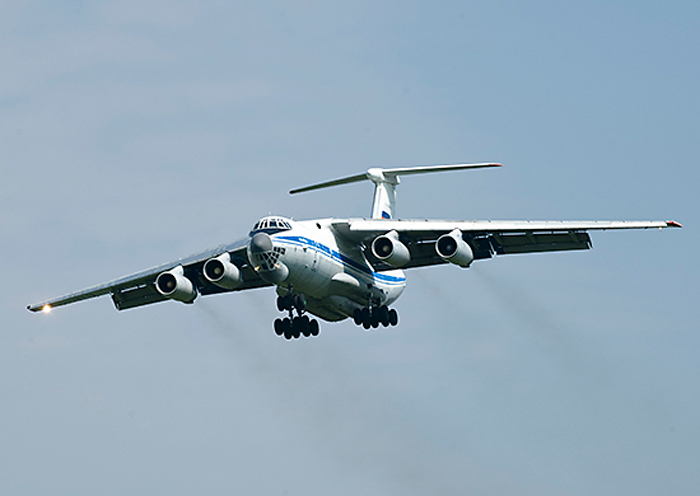 "The Russian military transport aviation's Ilyushin Il-76 airlifter with a special aero-medical unit swiftly transported Zaarur to Moscow on June 1[...]. In Moscow she arrived at the Russian Children's Clinical Hospital to receive medical treatment and rehabilitation," the Russian Defense Ministry's Press Service and Information Directorate said in a statement sent to Interfax on June 2. During the entire period of transportation from Aleppo to Moscow the girl's health was monitored by specialists of a team of highly-qualified military medics from the Burdenko Main Military Clinical Hospital and the Vishnevsky Central Military Clinical Hospital, the report said. According to the Russian Defense Ministry, Zaarur with her parents and sisters came under terrorist shelling from improvised mortars firing gas cylinders on April 16. The girl witnessed her three-year-old nephew and older sister being killed and lost both of her legs in the shelling. "Syrian doctors in the Aleppo civil hospital have done everything possible to save the girl's life, but after receiving heavy physical and psychological trauma she requires further treatment and rehabilitation," the ministry said. Zaarur's relatives approached Russian military officials in Syria with the request for her treatment and rehabilitation in one of Russia's hospitals. Russian Defense Minister Sergei Shoigu made the decision to send a military transport aircraft with a medical team on board to Syria for aero-medical evacuation of Zaarur to Moscow, the report said.